Daytona Beach Tree Pros are experts at tree removal when your trees that are damaged, unhealthy or unwanted on both commercial and residential properties. Trees are one of the most important resources that Mother Nature gives us, because they provide not only the vital oxygen that we breathe but they are also a home for many of nature’s important creatures and they add natural beauty to any landscape. That is why it is so important for them to be healthily maintained and tree removal on your property is sometimes a big part of that. There are several reasons why a tree on your property may need to be removed. Often times safety is one of these as trees begin to grow toward power lines or dangerously close to such things as the roof of your home or business. As trees grow, too many of them will also take away from the health and beauty of the other trees in your landscape; by removing a few of these it can do wonders for both the overall health and looks of your entire landscape. Daytona Beach Tree Pros has the expertise and equipment necessary to remove any tree in the best and safest way possible. One of the biggest reasons that necessitate Daytona Beach tree removal is what is commonly known as Invasive root structure. This occurs when trees get so large that their roots start to wreak havoc on such things as driveways, sidewalks, foundations and septic and sewer pipes. At the first sign of these things it is very important to take care of the problem right away because it is only going to get worse and more costly to repair. Unchecked root structure can do such things as weaken foundations and cause dangerous conditions on sidewalks by making them cracked and uneven. Tree removal Daytona Beach is never something that you want to do on your own because of the heights involved, dangerous working conditions and because the sophisticated equipment required to do the job right needs to be operated by trained professionals. That is why it is best when done by tree service experts such as ours at Daytona Beach Tree Pros. Our well educated and well trained arborists will come to your home and discuss the job with you and provide you with a free estimate for your tree removal Daytona job. You will probably be surprised that it is more affordable than you had expected as we offer some of the most competitive tree service pricing in the Daytona Beach area. Tree removal in Daytona Beach, FL should be looked at as a form of preventative maintenance. By removing weak trees or trees that are too close to structures, it can help prevent more severe damage when all too common Florida severe weather passes through the area. Much of the damage that the area has sustained from hurricanes over the last few years could have been avoided if important tree removal services were done ahead of time. 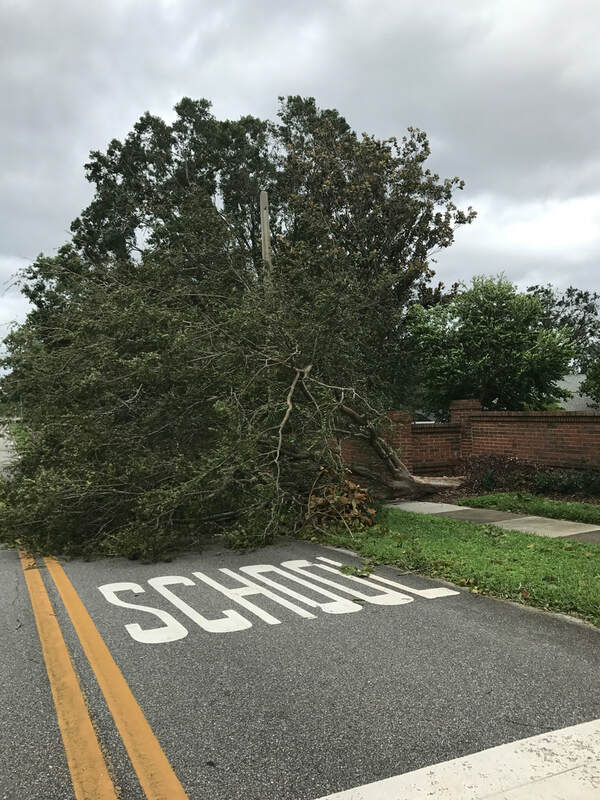 This type of storm damage is the reason the experts here at Daytona Beach Tree Pros recommend home and business owners take a more proactive stance in removing unwanted trees. This will prevent these trees form having the ability to significantly increase the damage to the surrounding area during periods of severe weather such as hurricanes. It is even more important than ever now as insurance companies are raising deductibles in storm prone areas to as much as 5% of your total home value for hurricane damage. That fact alone makes expert and safe Daytona Beach tree removal more important than ever. There are lots and lots of beautiful palm trees in lovely Daytona Beach, and when most people think of palm trees they think of the beach! These trees are great to look at, but they can also become unhealthy or hazardous, requiring their removal. We also can take of any palm tree removal needs that you might have. So before your palm trees get to the point of being a hazard and are encroaching on your home or business, call the pros to deal with this in a professional manner. One of the largest trees in our area can be a mature oak tree. Some of the largest oak trees in the state of Florida and have a diameter of over 15 feet, and can be hundreds of years old. So if you have a need for an oak tree removal Daytona Beach, make sure you call a company with the proper equipment and experience to tackle this monstrous and dangerous job. Don't even think about trying this yourself, as there are too many ways to get hurt to even count. And one of our technicians can come to your home or business and give you a free estimate, and maybe your monster oak tree doesn't require removal anyway, but rather can be cut back to achieve your goal. Our reasonably priced tree removal Daytona Beach service will not only improve the aesthetic and actual value of your home or business, but even more importantly they can minimize damage to your home or business when storms inevitably come. They can also help to keep you and your loved ones safer from threatening trees when this happens. At the very least, let one of our professionally trained and certified arborists come to your home and take a look at the tree threat situation on your property and provide you with an estimate to remedy this. At Daytona Beach Tree Pros, we carry a full workcomp insurance for our crew. This is necessary to give you confidence and added peace of mind while we work on the trees on your property. Call us today at 386-267-8220 and one of our experts at Daytona Beach Tree Arbors would be happy to come to your location and give you expert tree advice and discuss the best tree removal options! Tree removal can be very hazardous...only hire the PROS!